Did you know that the U.S. state that produces the most vegetables is going through the worst drought it has ever experienced and that the size of the total U.S. cattle herd is now the smallest that it has been since 1951? Just the other day, a CBS News article boldly declared that “food prices soar as incomes stand still“, but the truth is that this is only just the beginning. If the drought that has been devastating farmers and ranchers out west continues, we are going to see prices for meat, fruits and vegetables soar into the stratosphere. Already, the federal government has declared portions of 11 states to be “disaster areas”, and California farmers are going to leave half a million acres sitting idle this year because of the extremely dry conditions. Sadly, experts are telling us that things are probably going to get worse before they get better (if they ever do). As you will read about below, one expert recently told National Geographic that throughout history it has been quite common for that region of North America to experience severe droughts that last for decades. In fact, one drought actually lasted for about 200 years. 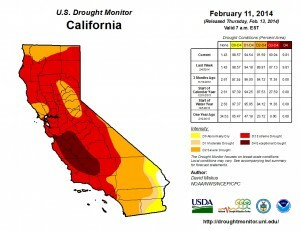 So there is the possibility that the drought that has begun in the state of California may not end during your entire lifetime. In the state’s Central Valley – where nearly 40 percent of all jobs are tied to agriculture production and related processing – the pain has already trickled down. Businesses across a wide swath of the region have shuttered, casting countless workers adrift in a downturn that calls to mind the Dust Bowl of the 1930s. Pumping from aquifers is so intense that the ground in parts of the valley is sinking about a foot a year. Once aquifers compress, they can never fill with water again. It’s no surprise Tom Willey wakes every morning with a lump in his throat. When we ask which farmers will survive the summer, he responds quite simply: those who dig the deepest and pump the hardest. California is experiencing its worst drought since record-keeping began in the mid 19th century, and scientists say this may be just the beginning. B. Lynn Ingram, a paleoclimatologist at the University of California at Berkeley, thinks that California needs to brace itself for a megadrought–one that could last for 200 years or more.